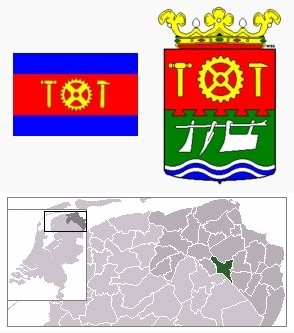 Flag and Coat of Arms of Hoogezand-Sappemeer. 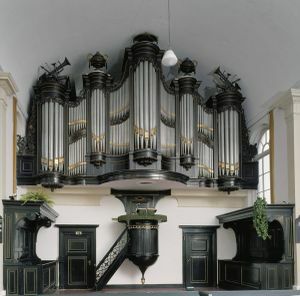 Organ and interior of the Doopsgezinde Kerk Sappemeer. Sappemeer, an industrial town in the Dutch province of Groningen (pop. 7,224 in 1947, with 180 Mennonites; in 2005 as Hoogezand-Sappemeer has a pop. of 34,409; coordinates: 53° 9' 35" N, 6° 45' 45" E), which together with the adjacent town of Hoogezand (pop. 13,194 in 1947, with 225 Mennonites) is the seat of a Mennonite congregation, in the 19th century mostly called Hoogezand-Sappemeer, and officially Sappemeer in the mid-1950s, the town where the meetinghouse is found. In 1618 a large lake east of Hoogezand, called Sapmeer or Sappemeer, was reclaimed, and in 1621 the first houses of what later was the town of Sappemeer were built on its grounds. In 1628 the adjacent wild peat moors had been opened up and the reclaimed land immediately settled. Among the settlers there were a number of Mennonites, some of them coming in from the province of Friesland. As early as 10 August 1629, the Reformed Synod of Groningen made mention of Mennonite activities here, and by 1631 there existed at Sappemeer a Flemish and a Frisian Mennonite congregation. Complaints about Mennonite activity were then made to the magistrates of the city of Groningen, which at this time was the owner of the reclaimed grounds. Soon the Mennonites must have been rather numerous at Sappemeer. There were at least nine different Mennonite congregations: (1) Frisians, (2) Flemish, (3) Ukowallists (a branch of the Old Flemish, followers of Uco Walles, (4) Danzig Old Flemish, (5) Waterlanders, (6) Groningen Old Flemish, (7) from about 1680 also Paltsers (Mennonites from the Palatinate, Germany), and from the early 18th century (8) Oude Zwitsers (Old Swiss Brethren), and (9) Nieuwe Zwitsers (New Swiss). Of some of these congregations there is little information. Of the Frisians nearly nothing is known but the fact of their existence in the earliest period. This group probably claimed Heero Jans and his son Berend (Bene) Heeres (from which the Benes family descended, still found at Hoogezand-Sappemeer), who in 1631 with a number of other Mennonites moved in from de Wijngaarden near Heerenveen, Friesland, and who settled at the Oude Friese Compagnie, later called Kalkwijk at the south part of the reclaimed area. This Frisian congregation apparently soon merged either with the Flemish or the Waterlander congregation. Concerning the Flemish congregation there is no more information; it also existed from the very beginning. It had a meetinghouse in the Kleine Meer (the former little lake, also reclaimed) in the southeast section of Sappemeer; this meetinghouse was renovated or rebuilt in 1691. About 1730 this congregation merged with the Waterlanders. Ukowallists (Uke-Wallesvolk) are mentioned at Sappemeer first in 1640. This group of the Mennonites especially had much trouble with the magistrates. In the conference of the Reformed Classis at Groningen, 30 May 1636, it was reported that the Mennonites at Sappemeer were building "a church to hold their meetings in it"; the magistrates of Groningen were requested to prevent this, and in 1640, apparently before the meetinghouse was complete, Johan de Mepsche, estate steward of the city of Groningen, bought this house by order of the magistrates. Consequently it could not be used as a meetinghouse. This house was located on the main road in the west part of Sappemeer. Probably this occurrence pertained to a planned meetinghouse of the Ukowallists. In 1647, when the new lands of the Borger Compagnie were distributed, a condition was made that the landowners were not allowed to sell their land to the "people of the Uke Walles sect." In 1642 the Ukowallists are said to have held their meetings on a farm belonging to Macke Gerkes van Dam (the family name of van Dam is still found at Sappemeer) on the Jouwerswijk. This was a canal, dug in 1630, along which farms were established, partly occupied by Mennonites moving in from Joure in Friesland, from which it took its name. It could not be ascertained whether the Ukowallists were identical with the group that later was called Groningen Old Flemish, or were a separate independent group. If the latter, they soon, at least before 1670, merged with the Groningen Old Flemish. The Danzig Old Flemish Mennonites are mentioned in the 18th century, but they obviously had a small congregation at Sappemeer from about 1650 or even before. They held their meetings in the homes of members, most living at the Kleine Meer. Flindrick Coops Boon, a well-to-do proprietor of land reclamations, peat merchant, and shipowner, the ancestor of the Boon family still living at Sappemeer, was about 1700 an elder of this church, which in 1699 acquired a meetinghouse on the Jouwerswijk. Jan Panneman and Jan van Dalen were preachers of this group about 1740-70. Jan Panneman at the same time served the Danzig Old Flemish congregation at Pekela, to which town he seems to have moved about 1665. In 1777 the Danzig Old Flemish congregation of Sappemeer died out after most members in course of time had joined the Groningen Old Flemish church. The Waterlander congregation at Sappemeer also dates from an early period. In 1647 this congregation was represented at a large Waterlander conference at Amsterdam by Egbert Harmsz and Doede Harmsz, apparently its preachers. During the first decades they held their meetings in private homes; later they had a meetinghouse in the Kleine Meer. In 1695 this Waterlander congregation, then numbering about 30 baptized members, joined the Sociëteit (conference) of Mennonite congregations in Friesland, and remained a member until 1769. About 1730 the Waterlander congregation merged with the Flemish congregation (2). Henceforth it is called either Flemish and Waterlander or Waterlander and Flemish or simply the Flemish congregation. This congregation contributed liberally to the needs of the Mennonites in Prussia and Poland in 1734. It was a member of the Flemish-Waterlander Humsterland conference c. 1756-65. Outstanding families in this congregation have been Mulder, Mandema, and Benes. Hendrik Jacobsz was a preacher here in 17? – c. 1733, Harm Jacobsz 1730-72, Watse Joukes (Mandema) (d. 1763) 1710-60, and Roelof Sebes 1764-72. In 1772 the Waterlander-FIemish congregation merged with the Groningen Old Flemish Mennonites. The Groningen Old Flemish had the largest congregation at Sappemeer. No figures as to the membership are available for the 17th century; in 1710 they numbered 140 baptized members, about 120 in 1750, and 116 in 1767. At first they too held their meetings in the homes of members, nearly all farmers living on the Kalkwijk, the Jouwerswijk, and the Borger Compagnie. At least in 1734, but probably some decades before, they had a rather large but very plain meetinghouse in the eastern section of the town (Borger Compagnie). This meetinghouse was used until 1847. The Groningen Old Flemish congregation was a member of the Old Flemish conference (sociëteit). Next to the congregation in Groningen (city) it was by far the largest Old Flemish congregation in the Netherlands. Like all Old Flemish congregations it was served by untrained preachers chosen from the members. Of the preachers of the 17th century only a few names have come down; they are Jacob Alberts and Harke Pieters, mentioned in 1681, Asink Abels in 1683. The first Dutch Naamlijst (1731) lists for 1731 Engelbert Jochems, Maarten Obbes, Maarten Garbrands, and Evert Hendriks. Maarten Garbrands (d. 1762) served 1704-c. 1760. Not only did Maarten Obbes (1676-1736) serve for a long period, but also his sons Obbe Meertens (1703-1782), serving 1733-1779, when he retired, and Hinrick Meertens, serving 1736-1780, as well as his grandson Meerten Obbes (Ubbens), serving 1774-d. 1786, were able and active preachers of the church. Others were Sjoert Clases, serving 1736-c. 1750, Alle Feyes mentioned in 1734, Jan Harms in 1748. Koert Izaaks Verveld (1719-1804) served from 1756 until his death, Harm Jacobsz, formerly preacher of the Waterlanders, from the union in 1772 until 1780, Sybolt Aans 1782-1785(? ), Jacob Luitjes (Reinders) 1780-1807, Pieter van Kalker (Calcar) 1786-c. 1813, Hayke Harms (Mulder) 1786-d. 1833, Rigt Eppes 1786-c. 1812. Pieter Hendriks, the author of Schrijtuurlijke Catechismus (1744), was very probably also a preacher of this congregation. In the course of time a number of members of other Mennonite branches joined the Old Flemish congregation; in 1772 the Waterlander-FIemish congregation (5) merged with the Old Flemish, in 1777 the few remaining Danziger Old Flemish (4) joined them, and about 1802 also the remnant of the Swiss congregation (8-9). From then we can trace the united church of Sappemeer (10). According to tradition, which, however, is not proved by documents, a number of Mennonites from the Palatinate, Germany, immigrated to Sappemeer in 1680-90, settling as farmers in the easternmost parts of the reclaimed area. If this tradition is true, they may have joined the Swiss Brethren, who settled here in 1711 ff. In 1711 a number of Mennonites came to the Netherlands from the Swiss canton of Bern. (See Swiss Mennonites in the Netherlands). A number of them settled in the Dutch province of Groningen, partly in and near the city of Groningen, partly near Sappemeer. They were soon (1726?) divided into two separate groups—the Oude Zwitsers (Old Swiss) being more conservative in life, dress, and doctrines, and using the German language in their church services until the end of the 18th century, and the Nieuwe Zwitsers (New Swiss) being more progressive and soon using the Dutch language in their meetings. The Old Swiss living at Groningen and at Sappemeer formed one congregation, meeting alternately at Groningen and at Sappemeer; the New Swiss of Groningen and Sappemeer also founded a single church, meeting alternately at Groningen and Sappemeer. Swiss Mennonite families settling at Sappemeer in 1711-1714 were Ancken (Anken), Baur (later called Boer, also de Boer), Fruttiger, Furrer, Gerber (Gerwer), Gut(h), (Goet, later de Goede), Kneubühl (later Kneubel), Gautschy (later Kousie), Krähenbühl (Krejenbul, later Kreiboer and Kraaiboer), Krätzer (Kratzer, Kraster), Krebs (Kreps), Lang (Lange), Lienders (Leenders), Lörts (Leurts), Lötscher (Latscha, Leutscher), Maihuser (Meihuizen), Mayer (Meyer), Moerer (Murer, Muur), Rich or Richen (Ricken, Righen, Rijkens), Roth (Root), Rüsser (Risser) or Reuscher (Ruysser, Ruischer), Sarbach, Schabels, Stauffer, Steiner, Stähly (Stehle, Stelli), Stucky (Stukje), Stutsman, Thöne(n) (Teune), Teutscher, Witwers and Sorg (Zorge). A number of these families after a few years moved elsewhere in the Netherlands or back to the Palatinate, while others came in from Kampen, Deventer, and Groningen. Most of them were provided with farmlands and houses through the agency of the Dutch Committee of Foreign Needs at Amsterdam and the Groningen Old Flemish conference. Especially Alle Derks, an elder of Groningen, deserved well of these Swiss immigrants, many of whom took along considerable amounts of money for the rest, which enabled them to run their businesses without the usual difficulties of settling in a foreign country. In 1811 descendants of the following Swiss immigrant families were still found at Hoogezand-Sappemeer: Anken, Boer, Gerber, Kneubel, Kousie, Kraaiboer, Kraster, Kreps, Leenders, Leutscher, Meihuizen, Meyer, Rijkens, Schabels, Stukje, and Teune. At the present time the church records of the Sappemeer Mennonite congregation still contain the names of members of the Boer, Meihuizen, and Rijkens families. The Oude Zwitsers held their meetings in a home in the Kleine Meer. There is no information about the number of their members, and the list of their ministers is somewhat unclear. The first Naamlijst in which they are mentioned is that of 1755. Ministers then were Abraham Loover (Lauffer), living at Groningen, from 1726, an elder, and Claus Gerber (from 1739) and Peter Riegen (Ricken) preachers. Other ministers were Jacob Stehle (Stähly) and David Righen (Ricken) from 1767. Claus (Nicolaas) Gerber served 1739-1761, Peter Righen 1740-d. 1772, Jacob Stehle 1736-1757. Abraham Loofer served until his death in 1774; Preacher David Righen then became elder, serving until his death in 1796. David Righen lived at Sappemeer; until the end he preached in German. A copy of Die ernsthajte Christenpflicht, darinnen schone geistreiche Gebatter damitt sich fromme Christen-Herzen zu alien Zeiten und in alien Nothen trosten können, which copy was owned and used by Ricken, is now the property of G. N. Schutter at Sappemeer. In the Old Swiss congregation, after the preacher had finished his sermon, other brethren spoke briefly to express their agreement with the sermon or to add a few words from the Bible. They knelt for (silent) prayer and practiced foot-washing in connection with their communion services. They seem not to have used a confession of faith; their hymnal was the German Ausbund. After the death of David Righen the Old Swiss seem to have merged with the New Swiss. The Nieuwe Zwitsers (New Swiss) also had a room on a farm at the Kleine Meer, probably the same as the one used by the Old Swiss, where they met every two weeks. Figures concerning the membership of this group are also not available. This group may have been somewhat smaller than the Old Swiss group, and in the course of the 18th century some of them, through marriage, joined the Danzig and particularly the Groningen Old Flemish congregations. They too practiced silent prayer and footwashing, but soon used the Dutch language in their services. They were not as strict in their dress regulations as the Old Swiss were, tolerating buttons instead of hooks and eyes, and shoes instead of boots. They used a Dutch confession of faith, drawn up by Jan van Koomen, Belijdenisse des Geloojs onder de doops-gezinde Christenen (1744), and also Dutch hymnbooks. Some of the Old Flemish Mennonites who had moved from Deventer to Hoogezand-Sappemeer in 1720 soon after joined the New Swiss congregation. Ministers of the New Swiss were Hans Ancken, serving from 1712, Michiel Ruysser, serving 1711-1759, elder, Peter Leenders, 1711-1757, elder, Jan van Komen (Koomen), d. 1743, Anthony Kratzer 1740-1779, elder from 1760, Christiaan Ancken 1754-1770, Jan Leenders 1754-1759(? ), Rudolf Leutscher 1755-1761, Jan van Kalker (Calcar) 1755-1775(? ), Balster Franszen 1762-1782, Hendrik Cornelis 1770-1808, elder from 1794, Isaak van Kalker (Calcar) 1772-1796, Roelof Jans 1781-d. 1790, Alle Cornelis 1791-1800, Ties Hansen Top 1791-1797. Most of these New Swiss preachers lived at Groningen. Van Komen and both the van Kalkers were not of Swiss decent. Obviously after 1800 meetings were only at Groningen, the Swiss brethren living at Sappemeer all having joined the main Mennonite congregation. In 1802 the deacons of the "former Swiss congregation" sold a house and a tract of land on the Kalkwijk, which had been the property of this church. The remaining Swiss congregation in Groningen merged with the main Mennonite church in this town in 1824. Not all descendants of the Swiss Mennonites remained Mennonites. Some of them may have joined the Reformed as early as the last decades of the 18th century, but more left particularly when the Mennonite Sappemeer congregation called a salaried preacher (see below), and again in 1847 when the old meetinghouse was abandoned for the new one, more in the center of the town. All of the Kneubel and Kreps families left the church in 1847, joining the Separate Reformed Church, and many members of other families, e.g., Kraster, Rijkens, and Stukje, also left. Among the outstanding Mennonite families of Sappemeer there is also the van Calcar (van Kalker) family. This family originally lived at Deventer, Dutch province of Overijssel. In 1720 Hendrik van Calcar and his wife moved from Deventer to Sappemeer and joined the New Swiss Mennonites. Hendrik's son Izaak van Calcar was married here to Maria Brunner, widow of Peter Lienders. Izaak van Calcar bequeathed his farm to Pieter Leenders (the son of Peter Lienders and Maria Brunner) on the condition that he assume the family name of van Calcar. Thus Pieter Leenders became Pieter van Calcar (married in 1783 to Dievertje Verveld, a daughter of the preacher Koert Izaaks Verveld); they have numerous descendants. Other settlers at Sappemeer were Georg Grüber and his family, refugees from East Prussia, who immigrated to the Netherlands and after living a few years on the island of Walcheren, settled at Sappemeer in 1744. Since the Flemish-Waterlander and Groningen Old Flemish had merged congregations in 1772 and the Swiss Mennonites had joined them about 1800, there has been only one Mennonite church at Sappemeer. 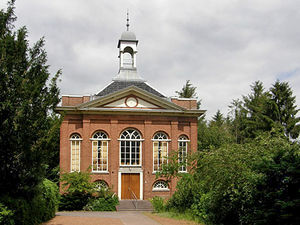 Until 1847 this congregation used the Groningen Old Flemish meetinghouse, which was remodeled and provided with an organ in 1808. A new church was built in the center of Sappemeer, dedicated on 21 February 1847. A parsonage had been built here in 1838. The membership of this united congregation was about 270 in 1790, 300 in 1834, 438 in 1861, 464 in 1900, 345 in 1926, 265 in 1958. The last untrained and unsalaried minister at Sappemeer was Heyke Harmens Mulder (Hayke Harmze) serving 1786-d. 1833. In 1790, because of lack of able men in their own group, the congregation decided to call a preacher from outside who was to be salaried. This was Foeke Wigles Gorter, a self-made man, not specially trained for the ministry, then preacher at Knijpe. Gorter served at Sappemeer until 1836. During his ministry a second minister was called; this was Pieter Feenstra, who had been trained at the Amsterdam Mennonite Seminary. He served at Sappemeer 1824-27 and again 1837-71. He was followed by S. G. Binnerts, serving 1872-1913, S. H. N. Gorter 1914-1916, F. ten Cate 1916-1935, B. Dufour 1935-1940, R. de Zeeuw 1941-1947, and G. M. Kosters from 1947. Since 1946 the pastor of Sappemeer has also been in charge of the Noordbroek congregation. Church activities now are a Sunday school for children, a Youth Group (ages 12-15), Youth Circle (ages 18-35), Brethren Circle, and Ladies' Circle. The Mennonites have always occupied an important place in the economic and cultural life of Hoogezand-Sappemeer. Until the end of the 18th century they were mostly farmers, a few being engaged in business, e.g., the Mulder family, who owned a tannery. The wealthy Boon, Boer, and Reinders families were large landowners, often engaged in land reclamation elsewhere. The Meihuizen and van Calcar families, who were farmers at Kalkwijk in the 18th century, later spread over the other peat colonies (Pekela, Veendam, Wildervank) of the province of Groningen, but many of them from the early 19th century had other trades and became millers, grocers, distillers, tanners, grain merchants, wood dealers, etc. The later generations have spread all over the Netherlands and both the Meihuizen and van Calcar families are now dying out at Sappemeer. In the 18th and 19th centuries some Mennonite families also were shipowners (Boon, Romkes, van Calcar, van der Goot, and Meihuizen). The Romkes and van der Goot families particularly have been wood dealers. The Calkema family, now extinct, owned an important lime burning business in the Oude Vriese Compagnie which was called Kalkwijk after this business. The Mennonites also owned a number of sawmills. Some of the businesses at Sappemeer under Mennonite direction and in part Mennonite owned are: the van Calcar distilleries (until 1896), Benes' flour mills, Smit's shipbuilding yard at Westerbroek, shipbuilding yard of Coops Brothers, engineering works of Douwe E. Gorter, dairies, a potato-flour mill, the Dijkhuis printing shop, Brand Brothers Lumber Yard and sawmills. Many Mennonites have been outstanding in the cultural and political life of Hoogezand-Sappemeer. The Hoogezand-Sappemeer section of the Maatschappij tot Nut van't Algemeen and the public library have largely been stimulated and led by Mennonites. A number of burgomasters of Hoogezand have been Mennonites. Boer, M. G. de. "Vom Thunersee zurn Sappemeer." repr. from Berner Zeitschrift für Geschichte und Beimathunde (1947). Cate, Steven Blaupot ten. Foorlezing over de opkomst van de Veenholonien Hoogezand en Sappemeer. Sappemeer, 1854. Cate, Steven Blaupot ten. Geschiedenis der Doopsgezinden in Friesland. Leeuwarden: W. Eekhoff, 1839: 187 ff., 200. Cate, Steven Blaupot ten. Geschiedenis der Doopsgezinden in Groningen, Overijssel en Oost-Friesland, 2 vols. Leeuwarden: W. Eekhoff en J. B. Wolters, 1842: v. 1, 144; see Index. Doopsgezinde Bijdragen (1861): 153; (1879): 5 ff. ; (1919): 74-76, 97-109. Doopsgezind Jaarboekje (1850): 55 ff. Gedenhboek Hoogezand-Sappemeer 1628-1928, particularly pp. 72-75. Hoop Scheffer, Jacob Gijsbert de. Inventaris der Archiefstukken berustende bij de Vereenigde Doopsgezinde Gemeente to Amsterdam, 2 vols. Amsterdam: Uitgegeven en ten geschenke aangeboden door den Kerkeraad dier Gemeente, 1883-1884: v. 1, no. 1893, 1896; v. 2, no. 1839 ff., 2219. Huizinga, J. Stamboeh . . . van Samuel Peter (Meihuizen) en Barbara Fry. Groningen, 1890. Lindeboom, J. "Sectewezen in Stad en Lande." in Groningsche Volksalmanak (1945): 53-79. Meihuizen, H. W. Foeke Wigles Gorter. n.p., n.d.
Naamlijst der tegenwoordig in dienst zijnde predikanten der Mennoniten in de vereenigde Nederlanden. Amsterdam, 1829: 62 ff. Stamboek van het geslacht Meihuizen 1400-1945, opnieuw samengesteld en angevuld door J. Meihuizen. (n.p., n.d.—1946): 41-67. Tegenwoordige Staat der Vereenigde Nederlanden. Amsterdam, 1793: v. XXI, 203 ff. "Van de oevers van de Thunerzee naar Sappemeer." Tijdschrift voor Geschiedenis 68 (1955): No. 2, 146-68. Schutter, G. N. and Nanne van der Zijpp. "Hoogezand-Sappemeer (Groningen, Netherlands)." Global Anabaptist Mennonite Encyclopedia Online. 1959. Web. 24 Apr 2019. http://gameo.org/index.php?title=Hoogezand-Sappemeer_(Groningen,_Netherlands)&oldid=141163. Schutter, G. N. and Nanne van der Zijpp. (1959). Hoogezand-Sappemeer (Groningen, Netherlands). Global Anabaptist Mennonite Encyclopedia Online. Retrieved 24 April 2019, from http://gameo.org/index.php?title=Hoogezand-Sappemeer_(Groningen,_Netherlands)&oldid=141163. Adapted by permission of Herald Press, Harrisonburg, Virginia, from Mennonite Encyclopedia, Vol. 4, pp. 419-422. All rights reserved.